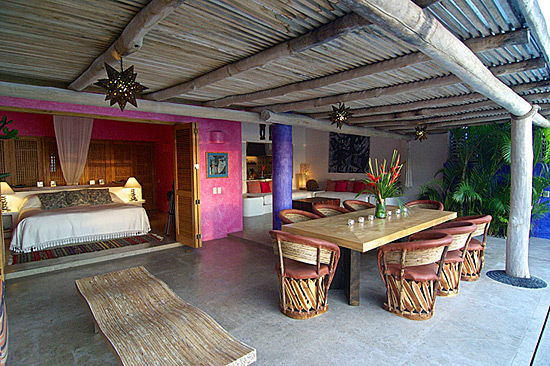 Casita Jazmin is located directly above famous Playa Rosa beach in Costa Careyes with an unsurpassed 180° view of the beach, the Pacific Ocean and several small islands. It offers complete open air living, yet feels sheltered and private. The Living and Dining areas are covered by a pergola and allow gentle breezes to blow while offering shade during the high noon sun. The small infinity pool and the lower sun-deck offer complete privacy. Clothing is optional. All Living areas, the Master Bedroom and the Kitchen are overlooking the pool and the lower deck with stunning ocean views and spectacular sunsets. Careyes is an overwhelming experience of nature that will encompass you the moment you arrive and will not let go of you until you leave. You can find piece here or stimulate your creative juices and you can let go of your inhibitions and your routines. Careyes is a place where you can wake up with the sun and go to bed with the moon and never see a soul, or where you can meet, eat, talk, drink and dance all night and sleep through the days. It's where you can have an entire beach to yourself and walk barefoot all day or where you can sit at 4-hour lunches with strangers from strange countries who are there for the same strange reasons you are. Careyes represents Art and outrageous Architecture, and it is unspoiled and untouched from the building boom and madness of the resort towns. Careyes celebrates the Chinese New Year with large bonfires on the beach, it hosts Arte Careyes, a Latin-American film festival, it organizes international polo tournaments, it is in the middle of a large wild-life reserve and it features some of the most spectacular homes in the world... and yet you will have a hard time finding it on the map. Costa Careyes has a dry season (Nov- May) and a wet season (June-Oct). The dry season, or "summer" (November-April), offers beautiful, sunny conditions, but typically has a few more breezes, especially January-March. November-December is quieter and the water temperature is higher. June, September and October are usually the wettest months and it is not unusual to rain for several days in a row. July and August however could be absolutely spectacular and one should not be deterred from traveling to Costa Careyes in those months. The majority of days could be fair with occasional afternoon and evening thunderstorms and the ocean is beautiful; however beware that mosquitos, which are almost not present in the dry season, love that time of the year as well.